A wonderful temple of Shri Swaminarayan (Akshardham) is situated at Gandhinagar, the capital city of Gujarat state. You can reach the akshardham by your private vehicle or city service of state transport buses from ahmedabad. It is 30 kms from ahmedabad and located in sector 20 of gandhinagar. It is made of only pink stone from Rajasthan and no steel and cement is used in its construction. The 5 Pradarshan Hall is also amazing. It explain the values of life in the decent manner of movies, statues etc. It takes 2 to 2.5 hours to visit. The newly introduced water and laser show is really magnificent. 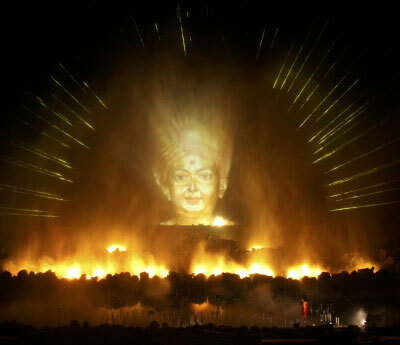 This type of water show is first in India and 5th in the world. 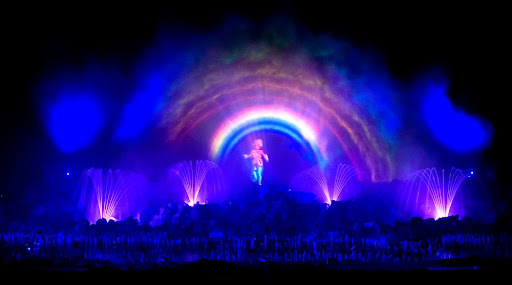 There are 40,000 water nozzles are used to make water show wonderful. This water show is the longest show in the world. It takes 45 minutes to complete. Every Monday all akshardham complex is remain closed. Water show timing is every evening 7:30. Nothing is allowed in the complex except your money purse. Mobile, camera and all types of luggage should be kept in the clock room at no cost. Even water bottle from outside is not allowed. All type of food is available inside at reasonable cost. Tobacco is strictly prohibited in the complex. Cost of pradarshan is Rs. 30 for full and Rs. 10 for half ticket. Water show ticket cost is Rs. 75 for full and Rs. 55 for half ticket. It is advisable to get your water show ticket at the time of entry in complex otherwise it may be full. Many other rides in mini amusement park are available for enjoyment at Rs. 10 only for elders and children.